There are many valid reasons to have your carpet cleaned but the three most important are about protection. Protecting the health of you and your family, protecting your carpet investment and protecting the carpet appearance. The number one reason to have your carpet cleaned is health. The health of your indoor environment. It's where you and your family live day in and day out or where you might spend the workday. The indoor environment of a typical home or office harbors indoor pollution including allergens, fungus, bacteria, contaminants from pet accidents, chemical toxins, hair, dust mites and the list goes on. With the high cost of energy, today's buildings are built air tight. For instance, most newer office buildings have sealed windows and don't allow outside ventilation. The only ventilation is from building's ventilation system. Reminds me of being in an airplane controlled by the on board ventilation system. If one person coughs or sneezes, all the passengers are subjected to the same circulated air. At least our homes can be somewhat ventilated during nice weather but most months our homes are closed up and controlled by the home's ventilation system. The result, indoor pollution, that can be up to 100 times more polluted than the outside air. These contaminants wind up in our carpet and upholstery, subjecting us to their harmful effects. Ever wonder why there are so many cases of asthma or allergies particularly among children? To better illustrate, think of your carpet as a giant filter on the floor that collects soil, bacteria, gases, toxic chemicals and other nasties that can adversely affect your indoor environment and ultimately your health. Over time this filter or "sink" fills up and needs to be emptied to keep it healthy. This is best accomplished through professional carpet cleaning services. I know what you're thinking, if carpet is such a collector of harmful dirt, why not remove the carpet and only have wood or tile floors? This, by the way, is exactly what many doctors advise patients to do who suffer from allergies or asthma. But whether you have carpet or not, the same pollutants find their way into your home. At least with carpeting, these pollutants get trapped and can be safely removed with carpet cleaning services. Without carpeting, the pollutants are free to circulate around the room or throughout the house with the slightest air movement. The second reason is to protect your carpet investment. Something most people don't consider with carpet cleaning services. Carpet, on average, is a home owner's third largest investment. The average home has several thousand dollars in carpeting alone. Carpet manufacturers recommend and often require routine carpet cleaning services to fulfill warranty terms, to not only maintain appearance, but to also promote a long life for the carpet. The number one enemy and destroyer of carpet is soil. This gritty sandy soil acts like sandpaper to grind away at your carpet with every step you take. Removing this abrasive soil through frequent vacuuming will help prolong the life of your carpet investment. But as vital as vacuuming is to maintaining the life of the carpet investment, no amount of vacuuming can remove all the harmful contaminants that hide in your carpet. The third (but most popular or compelling) reason for carpet cleaning is the appearance. Why clean if it doesn't look dirty? To help reinforce this mindset, today's carpet colors and weaves are designed to hide soiling. When your carpet finally does become an eyesore or source of embarrassment it's really an indicator your carpet is past due to be cleaned and may already be too late to reverse some of the damage. Carpet that's cleaned on a regular basis lasts longer, looks better and provides a healthier indoor environment for you and your family. Why employ New Life Carpet & Upholstery Service, Inc. for carpet cleaning services? Whether you're considering residential carpet cleaning or commercial carpet cleaning, the process starts with a free on site carpet assessment. Our carpet assessment is more than just a price estimate. We'll evaluate the overall condition of your carpet including the soil load, areas of concern, effective age, fiber type, carpet style, maintenance history and any installation problems. We'll suggest the services needed and give you an exact price quote. You'll know just what to expect so you can make an intelligent and informed decision. New Life Carpet & Upholstery Service offers the low moisture method of carpet cleaning. Low Moisture Cleaning is a fast drying method that utilizes a safe cleaning solution, an oscillating floor machine and absorbent pads to agitate and clean the carpet of all unwanted soil and harmful contaminants. A deep and thorough vacuuming of all areas to be cleaned is ALWAYS performed. What do the cleaning products of most carpet cleaning services leave behind? If you've ever had your carpet cleaned, can you remember how sticky the carpet felt, or how many spots quickly reappeared darker and larger, or how great it looked when cleaned but shortly thereafter, looked dull, dingy and worse than before it was cleaned? These are all symptoms of detergent residue. You would ask me to leave if I came to clean your carpet and told you I would be leaving behind a detergent residue that might be more harmful to your health than the dirt I came to remove. But this is exactly what typical carpet cleaning services unwittingly do when they clean your carpet (or upholstery or even your tile and grout flooring) with a detergent based cleaner. Detergent residue becomes a film that's left on practically anything cleaned with a detergent based cleaning product. No matter how often rinsed, its impossible to completely remove. Next time you are in the shower shampooing your hair, think about how much water it takes to rinse the soap out of your hair. If that much water is needed to rinse the detergent residue out of your carpet, imagine the problems caused by over wetting including mold and bacteria growth and that funky "wet dog" smell that often remains in damp, poorly cleaned carpet for days. Aside from the problems related to over wetting the carpet, consider how absorbent the skin is. Take this challenge: in the morning take a clove of garlic, cut in half and rub the wet garlic on the bottom of your bare foot, then get dressed. Within 24 hours you will taste the garlic in your mouth. Try it! The feet are very porous and can absorb pollutants or chemicals. Imagine what your skin can absorb if you walk around your home in bare feet or allow your children to crawl or play on your carpet. The skin will absorb toxic cleaning chemicals found in the carpet. The purpose of carpet cleaning is to produce clean carpet! 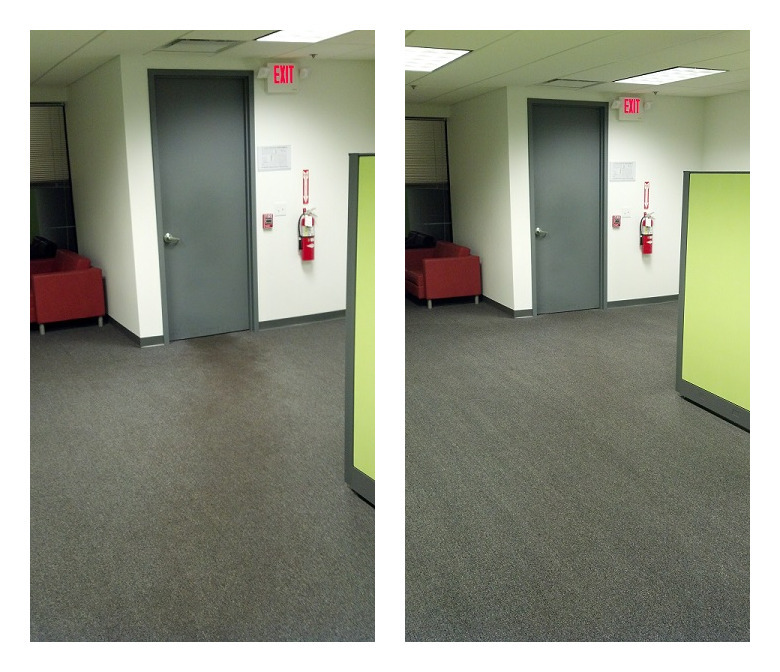 Clean carpet that contributes to a healthier indoor environment. Carpet that's free of soil, and unhealthy contaminants is a benefit of carpet cleaning. To try and rid your carpet of soil, allergens and other nasty stuff with a detergent that leaves behind detergent residue which often contains toxic chemicals, defeats the purpose of cleaning. In case you can't tell, we at New Life Carpet & Upholstery Service are passionate about clean healthy carpet. Our cleaning solutions are free of detergents and the many problems associated with soapy, sticky residue issues. Instead, we use Soap Free Procyon Cleaning Products. Green Seal Certified, Woolsafe Certified and Indoor Air Quality approved, Soap Free Procyon is non-allergenic, non-toxic and odor-free. It offers true carpet cleaning, rather than gumming up carpet fibers.